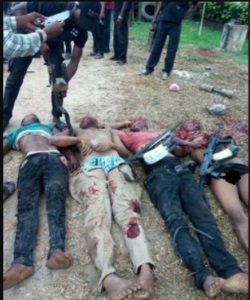 Some notorious armed robbers have been gunned down after they attacked a lodge in Delta state. The robbery gang believed to be terrorising Isiokolo and its environs, was said to have attacked the lodge few days ago, carting away valuables belonging to the defenseless corps members. A source at the police division disclosed that detectives had been on the trail of the suspects, adding that with the assistance of the local vigilance group, operatives busted the robbers in neighbouring Kokori town after a major robbery operation. Contacted on Tuesday in Asaba, acting Public Relation Officer, of the state police command, ASP Chuks Oresewezie, confirmed the story, saying efforts had been intensified to clamp down on the fleeing robbers.